a few weeks ago, i came across this wonderful idea on a great website, red bird crafts. they're story stones, to go along with a cute mouse story. click on over to see how she made them! i love the fact that she uses fabrics for the pictures... they're really adorable! and i knew i had to make them! it's been kind of an ongoing project. i've seen story blocks before, but i just love her idea of using stones instead. it involves such a nice process... both in and out of the home. it's not just about the end result, but all of the steps along the way. i'm realizing the more and more leo and i do projects like these together, the more valuable the creations become. and the actual process is even more precious. and were left with this lovely pile of stones. a great pile of story stones. i love them! 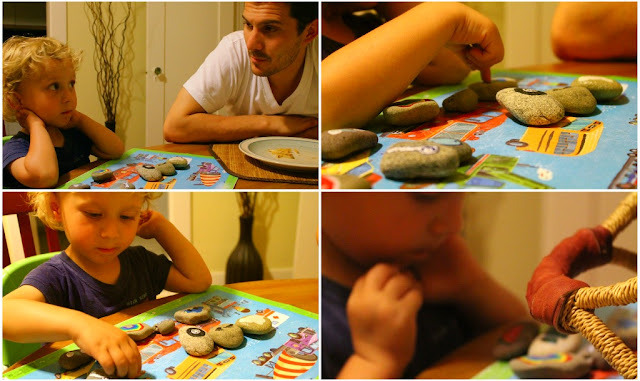 at a little over 2 1/2, leo is not quite at an age where he is creating stories on his own, so these stones are such a wonderful prompt for him. we'll sit, grab some stones, and take turns building stories together... it is just so wonderful to hear the ideas he puts into words. thank you, emily, at red bird crafts, for such a wonderful dose of inspiration! thanks, lorena! have fun... this one has been great! I love all your ideas I am so gonna do a few during August!! I'm going to include a link to this project in that post. What a great way to get young children to learn the beginning basics of storytelling. @ jackie... thanks so much, jackie! my son has been absolutely loving these... and they were a lot of fun to make! i saw the original idea of using stones on red bird crafts and had to do it! i wandered over to your website... what a great resource you have for literacy ideas! I love this idea! What a great way to spark the imagination. wow! I love this idea! Sharing on pinterest!